Monarch Elementary School, Louisville, CO.
Now is an excellent time for communities to make decisions that will create environments that encourage walking and bicycling to school. These decisions will determine whether walking and bicycling are feasible school travel options for children in generations to come. The U.S. Department of Education estimates that U.S. student enrollment will grow by more than 3 million between 2011 and 2022 (2014b). This growth will necessitate new school facilities. In addition, more than half of the school facilities in the U.S. are more than 40 years old. As a result, many existing education facilities will need to be upgraded (U.S. Department of Education, 2014a). With the growing demand for new and renovated facilities, communities need to make informed decisions about implications of school construction, renovation and the importance of maintaining walking and bicycling as an option. In August 2005, federal legislation established a National Safe Routes to School Program that provided $612 million towards Safe Routes to School from 2005 to 2010. In July 2012, transportation legislation, MAP-21, was enacted that no longer provides dedicated funding for SRTS but instead makes SRTS projects eligible under the Transportation Alternatives Program (TAP). Some states are using a combination of TAP, Highway Safety Improvement and Surface Transportation program funds to support Safe Routes-related projects and activities. MAP-21 also channels TAP funds directly to Metropolitan Planning Organizations (MPOs), making them another important source of funding. In addition, some states still have dedicated SRTS funds. 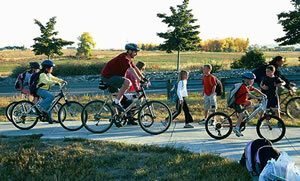 For more information about the federal SRTS program and MAP-21, go to http://www.fhwa.dot.gov/environment/safe_routes_to_school/ and www.saferoutesinfo.org.